I love the graduate classroom. In the capacity of professor, I am fortunate to work with some of the brightest minds and lead, nurture and grow the future Public Administration leaders of tomorrow. Foundations of Public Administration is, in my humble opinion, one of the hallmark courses for any MPA student and I take seriously the steadfast charge to present and explore the impact of seminal documents that serve as basis for governance and free society. Exploring these documents has never been as important as it is today. Evidenced by the polarity and division that has taken hostage our civil society. Polarity and division are not new in our democracy. The variance, circa 1776 and the eras of leaders like Jefferson, Hamilton, Monroe, Madison and Wilson, et al., lays not in their disagreement — rather in their source of agreement. Think through this. The ability to begin a dialogue around the areas of agreement — versus beginning from the stanchion of partisanship is what made the Founding Fathers and Architects of Democracy extraordinary leaders. Guiding my students through the “warning of factions” in Federalist 10 or the principles of “checks, balances and separation of powers” in Federalist 51 is essential for aspiring MPA scholars. 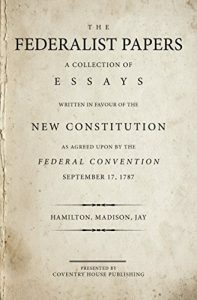 These essays, though designed to promote the adoption of the Constitution, continue to have relevance and applicability today — none more powerful than the recent herald of Federalist 77 in one of the most critical United States Senate floor speeches ever uttered. 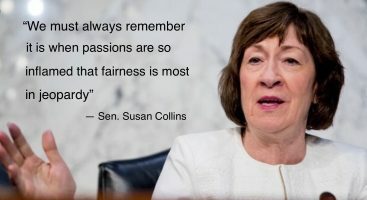 Senator Susan M. Collins (R-ME), reminded us as Americans that we are to be keenly aware and suspicious of those who would seek to “appear as a faction” (Federalist 10) or seek to usurp “advise and consent” (Federalist 77) during one of the darkest displays of polarity and partisanship in our history: the nomination of Judge Brett Kavanaugh to the Supreme Court of the United States. In this nomination process, we witnessed strong and passionate views unfold. These varying opinions and views are what makes debate rich and robust. Though healthy debate was replaced with emoluments in an effort to persuade (nay, usurp) lawmakers and our democratic processes. The conundrum? How to use the examples of emoluments and trolling of lawmakers inside the sanctuary of our Capitol to the front steps of their private residence and continue to extol that Public Administration is still the noblest of callings in which to pursue. The conundrum? Heralding the foundational elements of the Constitution are alive and well when the truth is, those elements are in peril when polarity reigns and are replaced with emoluments as influence. Senator Collins, in one of her most passionate floor speeches ever, eloquently stated, “…. 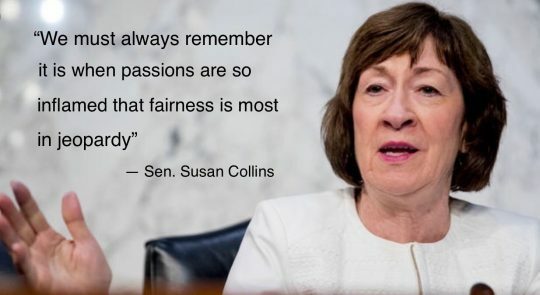 we must always remember it is when passions are so inflamed that fairness is in jeopardy.” The enormous challenge remains: growing and cultivating leaders who, like Senator Collins, recognize that foundational principles are necessary for our process to persist. Emoluments, threats, and senseless acts of violence exist to erode these foundational principles and pilfer a Professor’s ability to focus on governance and public leadership. Instead, the focus shifts to ethical acquiesce and accountability. This piece is for each of us—Public Service leaders—who live, work, teach, foster and promote the advancement of public interests; uphold the Constitution; promote democratic [peaceful] participation; strengthen social equity; inform and advise; demonstrate and promote integrity and ethics; and advance professional excellence. This piece is a reminder that we are to be keenly aware and suspicious of those who would seek to “appear as a faction” under gilded agenda’s formed solely on divisive partisanship. Like many of you, I remain stunned at the atrocities we have witnessed throughout the past few weeks. Though, like many of you, resolve and reaffirm that core foundational elements of those words contained in the US Constitution and the lamentations from the authors of the Federalist Papers in support thereof, are the catalyst to continue serving in Public Administration capacities. They remain the focus of my commitment to my students — inviting healthy discourse. Will you join in this crusade?